From the world-famous author of THE NAME OF THE ROSE, an illuminating and humorous study on the pleasures and pitfalls of translation. 'Translation is always a shift, not between two languages but between two cultures. A translator must take into account rules that are not strictly linguistic but, broadly speaking, cultural.' Umberto Eco is of the world's most brilliant and entertaining writers on literature and language. In this accessible and dazzling study, he turns his eye on the subject of translations and the problems the differences between cultures can cause. The book is full of little gems about mistranslations and misunderstandings.For example when you put 'Studies in the logic of Charles Sanders Peirce' through an internet translation machine, it becomes 'Studies in the logic of the Charles of sandpaper grinding machines Peirce'. In Italian 'ratto' has no connotation of 'contemptible person' but denotes speed ('you dirty rat' could take on a whole new meaning!) 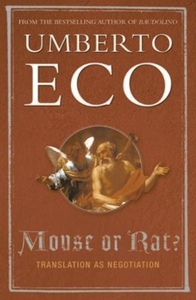 What could be a weighty subject is never dull, fired by Eco's immense wit and erudition, providing an entertaining read that illuminates the process of negotiation that all translators must make.